I found a beautiful siamese kitty at the humane society who has forever won a place in my heart. However, she has one bad habit and that’s chewing on electric cords. More than once my computer speakers have went dead and my mouse kicked the bucket too, thanks to her naughty vice. So, I became desperate to find a solution. 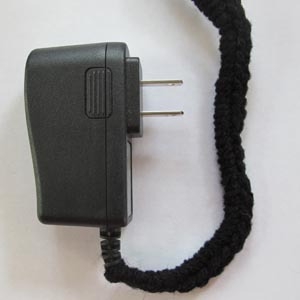 Thankfully, through the crafting grapevine, I heard of crocheting a cover over the electric cords to discourage chewing. I decided to give it a try and it is oh so easy to do! I recommend using black scrap yarn to blend in with the cord. Row 1: sl st yarn around electric cord, sc the entire length of the cord enclosing it within the sts. Finish off. This entry was posted on Wednesday, June 6th, 2012 at 12:29 PM by Emilee Gettle	and is filed under Free Crochet Patterns. You can follow any responses to this entry through the RSS 2.0 feed. You can skip to the end and leave a response. Pinging is currently not allowed. Idea! For those like me that have a million cords that need to be protected and stay together, use this to hold them and bind them in one place. Since it protects against kitties, it’s better than zip ties! The only thing is that Siamese also love to chew on wool! I have had sweaters shredded as a result. Better you go to the office supply store and get the plastic cord cover/gatherer to cover your cords. The is a strip that winds around and is loose enough that the cat can’t bite down on solid cord… and is not as attractive. Be sure to hang cords (crocheted is good here!) from doorknobs and other places where your cat can play with them. Have you seen Crochet With Raymond (another Siamese)? Raymond is busy trashing a woven rag rug as he plays with his mice…but at least he is not after the spinning! Neat look, you could also soap the cords that can’t be crocheted – or have a Siamese who loves to chew wool. Take a bar of soap and run the cord over it a few times. It won’t hurt the kitties since it’s made to use on your body but it tastes terrible! Congrats on getting a Siamese! Best cats ever – I have 2. Will never be able to have any other kind of cats. Siameses are soooooo unique! I agree. We had Nermyl the very dark Siamese for 15 wonderful years. Beautiful and brainy – so smart. And loving! Might scare a kitty away, but I can’t guess how many cords I’ve spliced, replaced or how many new webcams, keyboards or mouses I’ve went thru because of puppy teeth. This cord cover would only entice them. They love yarn toys. And soap??? That’s a whole ‘nother story under things my dogs love to chew. I could write a book. If you can discourage your kitties from chewing and scratching which is their natural tendencies, more power to you. By giving my youngest cat her own scratching post and having cardboard boxes strategically placed wherever she can find them, this has discouraged her from chewing on the electrical cords. I have many electrical cords around my house, especially where my computer, TV and other electrical devices are plugged into surge protectors. She has disintegrated many a cardboard box, but has not chewed on any cords. She was fond of brightly colored shoe strings, too, but that stopped past the baby kitty stage. I am wondering if there is a way to make the wire covers without doing it around the wires. I would like to make these as gifts so therefore do not have access to the wires without ruining the surprise.